Felice Anno Nuovo! I’ve been lax in my entries lately due to holidays and work, but it’s 2011 and a new year to write. Yesterday was the Epiphany, which celebrates the arrival of the Three Kings bearing gifts to Jesus, as well as the end of the 12 days of Christmas. It also signified the arrival of La Befana. In Italian folklore, La Befana is an old woman (often depicted as a witch) who visits Italian children on Epiphany Eve and, like Santa Claus, fills their stockings with gifts—or coal, if they’ve been naughty! There are various stories about how La Befana came into existence, but my personal favorite is this one: the Three Kings asked La Befana to come bring gifts to Jesus, but she declined, saying she was too busy sweeping—of course, nothing is more important than house cleaning! She later changed her mind, but couldn’t find Jesus and now spends her days giving gifts to children. Michael remembers putting out slippers on the night before the Epiphany and having La Befana leave a few toys. (Yes, she flies all the way to New Jersey!) Last night, I don’t know if Alex realized that La Befana had visited our home, but he certainly enjoyed ripping the wrapping paper. Our friend Luana and her family went to Urbania this year for the “Festa della Befana” which is a celebration that Michael and I attended last year. Urbania is a small medieval town close to the lovely Renaissance city of Urbino (it’s said that Urbino was spared from WWII bombing because the Allies mistakenly bombed Urbania instead). For the past decade, Urbania has branded itself as the birthplace of La Befana, similar to how Santa Claus resides in the North Pole. Children from all over Italy send letters to La Befana in Urbania. According to Samuele Sabatini, who organizes the Befana celebration in Urbania, “Babbo Natale (the Italian Santa) has a house at the North Pole, but nobody ever said where the Befana lived. So we decided that she lived here in Urbania. And the Befana has liked the location.” It’s true; Italians dressed as the good witch come from all across the country—we heard Neapolitans, Marchigiane, and Tuscans when we were there. 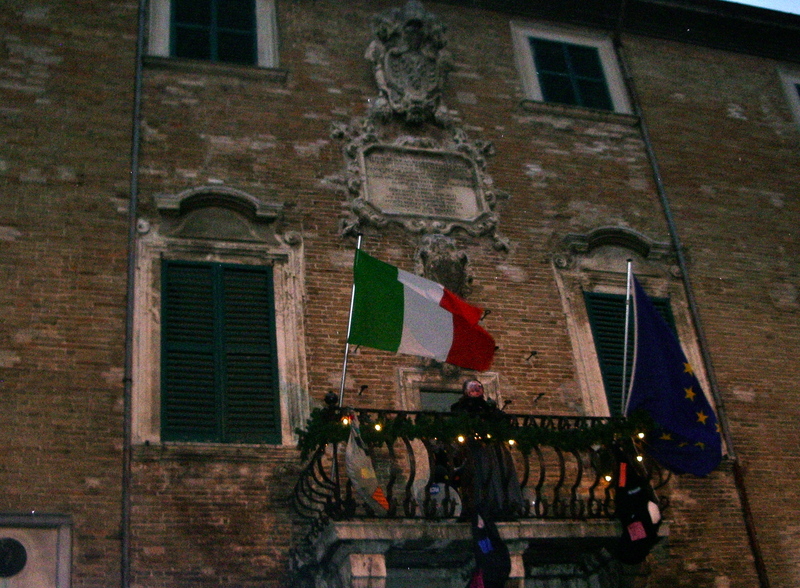 The town hosts an annual week-long festival in early January in her honor, complete with fireworks, vendors selling local foods, and which culminates in La Befana riding down from the main bell tower to the ground, showering candy on the crowd. Tens of thousands of people attend—rain or shine. Last year, it was a cold, rainy day, but that didn’t hamper the festival—parents and children were gleefully sampling hot roasted chestnuts, waffles (they’re like funnel cake in Italy—Americans have them for breakfast, but Italians serve them at fairs) and hot chocolate. 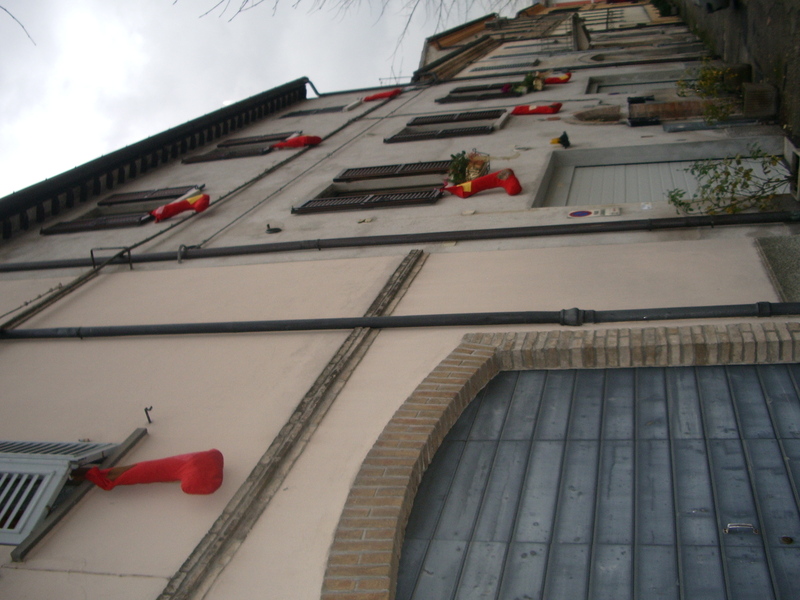 Large calze (stockings) hung from windows and doors around the town. According to Luana, one of the stockings is 50 meters in length, making the Guinness Book of World Records for the longest stocking. A mule led a parade of men, women and children—some on stilts—dressed in colorful witch costumes. We ducked inside a café to get two cappuccinos and warm up. The place was packed with locals and tourists. After sampling some delicious coffee, we proceeded to the main piazza where the real highlight of the day was about to happen—La Befana was going to fly. As it turned out, and to the delight of all the children, dozens of different befane peered out from windows in the town hall, waving and throwing candy to the crowd below. We ducked under a large umbrella and peered up to the bell tower, where the Mayor of Urbania gave a speech. Then, the strega was lowered on ropes, appearing to fly on her broom across the piazza. A burst of fireworks followed, lighting up the darkening sky. 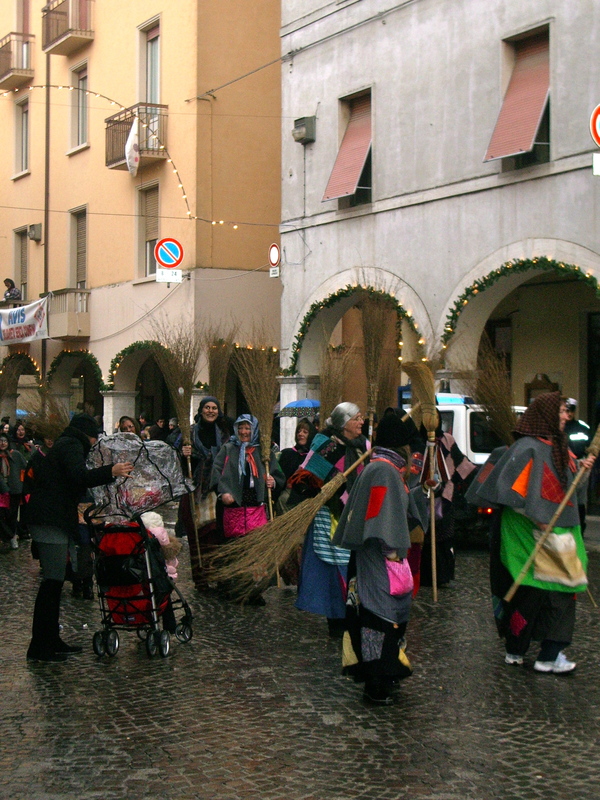 This entry was posted in culture, Italy and tagged Christmas, culture, Epiphany, festival, Italy, La Befana, Urbania. Bookmark the permalink. That’s a lovely story! It’s a shame that the UK and US can’t wait to shake off christmas and don’t celebrate the twelve days. What else does January offer, but dark days and rain? !